DC’s Young Animal imprint, founded by Umbrella Academy co-creator (and former My Chemical Romance frontman) Gerard Way in 2016, was a shining beacon of weirdness and wonder throughout its initial run. Titles like Way and Nick Derington’s flagship Doom Patrol, Cecil Castellucci and Marley Zarcone’s Shade, the Changing Girl (and later Woman) and Magdalene Visaggio and Sonny Liew’s Eternity Girl modernized the experimental, boundary-breaking spirit of early Vertigo, re-contextualizing familiar DC faces and introducing entirely new characters to the publisher’s pantheon. When DC and Way announced an indefinite hiatus for the imprint in August 2018, we were despondent. Thankfully, that hiatus is less indefinite than originally reported—and we’ve got the full scoop on Young Animal’s impending return. 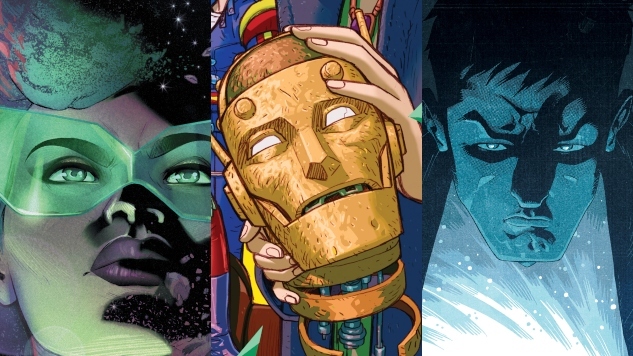 Starting this July, Doom Patrol returns as Doom Patrol: Weight of the Worlds, and it’ll be joined by two brand-new series: Collapser, also out in July, and Far Sector, coming in late 2019. The next phase of Doom Patrol maintains Way in the writer’s seat, with Jeremy Lambert co-scripting, original artist Nick Derington on covers and a murderer’s row of interior artists trading spots, starting with James Harvey and followed by Evan “Doc” Shaner, Nick Pitarra, Becky Cloonan and more. Collapser, an entirely new concept separate from the shared DC Universe, finds Gerard Way’s brother and former MCR bandmate Mikey Way co-writing alongside The True Lives of the Fabulous Killjoys scribe Shaun Simon, with G.I. Joe: First Strike artist Ilias Kyriazis on interiors. Far Sector, meanwhile, marks the comics debut of award-winning author N.K. Jemisin (The Broken Earth trilogy), with breakout Naomi artist Jamal Campbell joining her for a new and original Green Lantern story. Paste readers can check out official synopses of Doom Patrol: Weight of the Worlds, Collapser and Far Sector below, along with first looks at the initial covers. Check back later today for an exclusive interview with Mikey Way and Shaun Simon to learn more about Collapser, and stay tuned to Paste for all things Young Animal as the imprint’s relaunch gets closer.